Set in the 3rd century BC, "The Emperor and the Assassin" tells the story of Ying Zheng, a power-hungry heir to the throne of the Kingdom of Qin, whose only goal is to conquer the other six kingdoms existing in China, and merge them into his own, and under his rule. 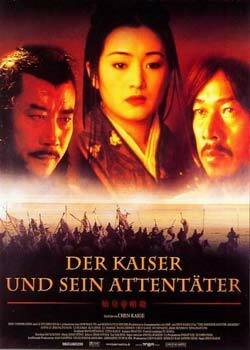 In preparation for the second to his six assaults, Ying gains the help of his concubine Zhao (Gong Li- The Story of Qiu Ju, Raise the Red Lantern, To Live, Shanghai Triad, and Wayne Wang's recent Chinese Box), who travels to the kingdom of Han as a spy, in order to make the king believe that she has fallen out of favor with Ying. Once in Han, and together, with the king, Zhao will find an assasiin, who will be sent to kill Ying, but Ying will be prepared for the assassin's onslaught, and in defending himself, will be considered unstoppable.